Sunday February 23 1908 I was busy with the work and wrote a little. Will helped me do up the dinner work and I took the butter for the home folks and went on the car to Woolfs. Tishie & her family were there. Will seemed a trifle better. I went on over home where I found all the Stevens family. After supper Hattie & I went to town with Rob. Will was at the store & he & John sent to church with us girls. Home at 9.20. 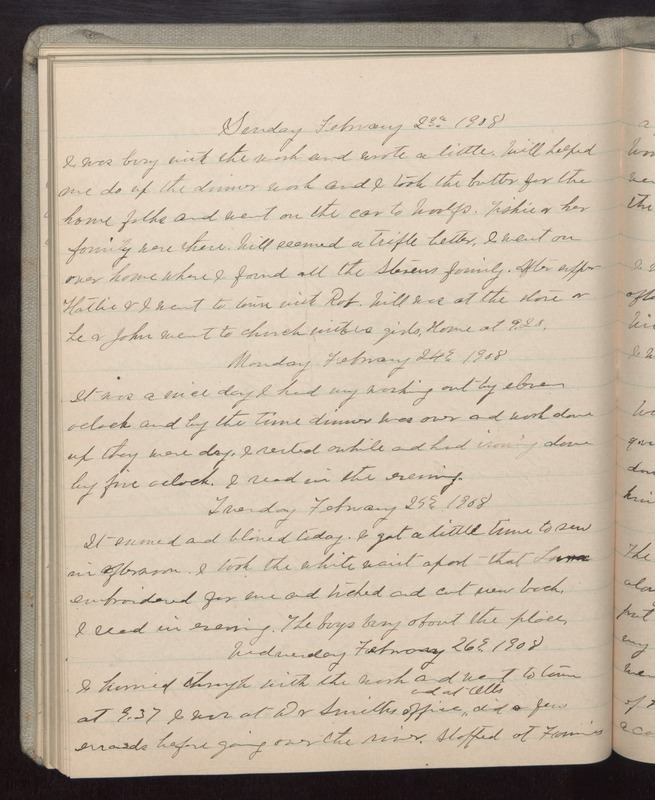 Monday February 24 1908 It was a nice day I had my washing out by eleven oclock and by the time dinner was over and work done up they were dry. I rested awhile and had ironing done by five oclock. I read in the evening. Tuesday February 25 1908 It snowed and blowed today. I got a little time to sew in afternoon. I took the white waist apart that Lorna embroidered for me and [illegible] and cut [illegible] back. I read in evening. The boys busy about the place. Wednesday February 26 1908 I hurried through with the work and went to town at 9.37 I was a Dr Smiths office and at Otts did a few errands before going over the river. Stopped at Fannies.